Small Business Server 2008 comes with a POP3 connector even though it is not listed in the Getting Started Tasks and it is not configured by default. 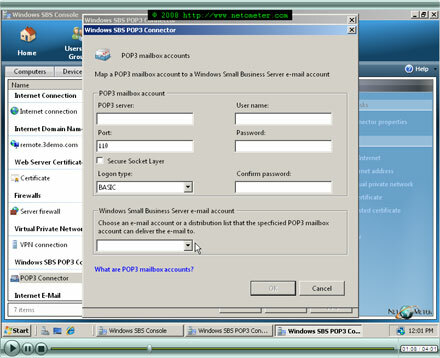 â— When a user replies to an e-mail delivered through the POP3 connector, the message is sent from the local Exchange Server (or through a SmartHost – how to configure a Smart Host in SBS 2008). Windows SBS 2008 does not route the reply through the original POP3 e-mail server. â— You can choose between the following types of authentication â€“ BASIC (the logon credentials are sent unencrypted â€“ in clear text), SPA (Secure Password Authentication), and APOP(Authenticated Post Office Protocol). â— You can use SSL (Secure Socket Layer â€“ normally over port 995), if the POP3 provider supports this option. In that case, using BASIC authentication is fine, and we are demonstrating this scenario bellow. In the following Step-by-Step video tutorial, you will see how to configure a POP3 connector in Small Business Server 2008.
how can i reduce retrival interval to 2 minute in POP3 scheduling? can you help me? The minimum is 5 minutes. Will be great if you can create a tutorial on how to import / retarget the old emails in Outlook on a peer to peer computer when that computer is joined to domain and now need to have emails delivered via exchange rather than direct POP.